Day Two - Woko National Park is the leg bit at the bottom left. Myall Creek Camping Area is top left. The town of Nowendoc is the small red bit middle top. What a night of rain! We thought that it had rained a lot yesterday, well overnight it was worse. From about three it absolutely pours and does not ease up till about five. When we get up at about 8 am, it is very steamy even though the temperature is only 19ºC. After breakfast of bacon sandwiches, we read a little till the rain again eases. We quickly put away the tents and pack up. The rain is still holding off (just a very light mist or drizzle) so at 10 am we decide to go for a walk (or should I say, I convince the others to go for a walk). We decide to do the Brush Turkey walk. This is only 1.1 kilometres and is a shorter version of the longer walk here which has been described by a friend as the only walking track to nowhere. Anyway, we head off. We have not gone far before I hear a loud yell from Kelly. Leaches!!!! Kelly hates leaches, she reckons that even if there was only one leach in a forest, it would find her. She has quite a few on her. We check and sure enough, we all have multiple leaches on our boots. We knock them off with sticks and quicken our pace. Hell, there are a lot of leaches. I soon have counted over 20 on my boots alone. Soon Kelly is sprinting ahead to get away from them as she has the little bastards crawling in through holes in her old boots. When I get back to the roadway, I knock off 24 more leaches from my boots. Thankfully, none of us get any of them on our body. This would be a nice walk if it was dry. On this one walk alone, I have had at least 10 times the total number of leaches on my boots as I have had in all the rest of my bushwalking days put together. Back at the cars, we decide to get out of here. We leave at 11:25 am and instead of taking the most direct route out (the same way we came in), we decide to drive the rest of the flood detour road and then come back across the two crossings of the Manning River. This is a nice drive, and Kelly spots a couple of water monitors (large lizards) in the river. We head back to Thunderbolts Way and head north-west towards Walcha. At 12:05 pm we pass Glory Hole Reserve. This is run by Gloucester Shire Council and is located not too far along Thunderbolts Way. About seven kilometres further on is another council run camping area, Bretti Reserve. Both these are on the Little Manning River and appear quite nice, if not a little crowded. They both have toilets at least. The run up this road is slow, as it is a very windy road and as we have climbed, there is a lot of fog/low cloud about. At 1 pm we arrive at Nowendoc which is a few hundred metres off the main road. This town is a lot smaller than I had imagined, with only a small general store (sells petrol and alcohol as well), a Police Station and a school which is some kilometres out of town for some reason. We have to buy something from the store so we drop in there first. It starts to rain a lot heavier now and we go to the nice picnic area which has a large undercover area with tables and nearby toilets. We decide to have lunch here. We leave at 1:45 pm. 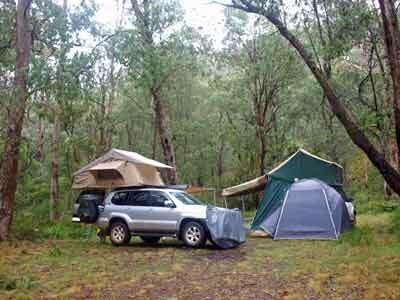 On the NPWS web site I have found that there is a camping area in Nowendoc National Park. This is called Myall Creek Camping Area. Unfortunately, this is all I can find out about it. The directions to find it are sparse. I had tried looking on Google Maps street view for the access road but have not been able to find it. For some reason, I thought that there would be a sign to the camping area or at least the national park. 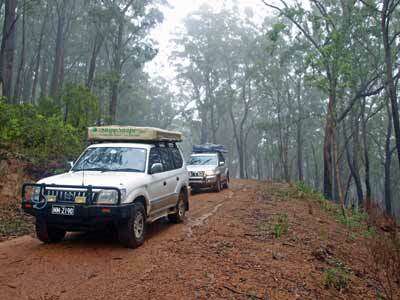 To find the park, you have to travel 18.5 kilometres north of Nowendoc on Thunderbolts Way to Wild Cattle Creek Road. This road is also only a kilometre or so out of town, so presumably it links up with the other one. Anyway, at this location (GPS S31º 24' 36.4" E151º 35' 16.2" using WGS84 as datum) you will see the road sign and perhaps a mention of the state forest. The road has a gate which is closed but not locked. 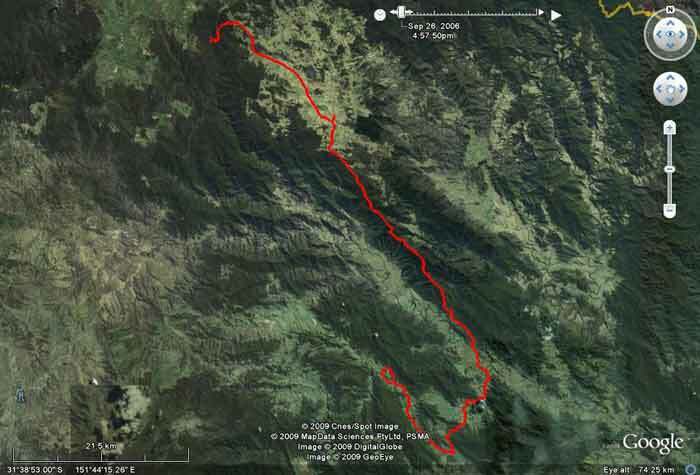 Once through the gate, you drive 4.5 kilometres through the state forest till you come to Myall Creek Management Trail (it also has a sign from memory to Myall Creek Fire Trail). This track gets to over 1300 metres and there is some very nice pine forest on both sides of the road. The intersection is at GPS S31º 25' 40.8" E151º 34' 03.8" using WGS84 as datum. If you follow the Myall Creek Management Trail you exit the state forest and pass through another gate into an open area. Ahead is Myall Creek Management Trail (there are trails to the left and right as well). The track is signposted as Dry Weather Only but it is a very well built track, with no worries about using in wet weather as there is a good gravel base. As we have come so far and have no alternative, we head on. It is a relatively steep drop down into the valley, you lose over 350 metres from the top. I use low range, but only because it is wet. At the bottom of the valley the track follows the Myall Creek. About 2.5 kilometres from where you left Wild Cattle Creek Road, there is a small clearing which we presume was the camping area (GPS S31º 25' 37.3" E151º 33' 31.2" using WGS84 as datum). The site is 960 metres above sea level. There is a single old fireplace behind a tree and space for about three or four cars at the most (and this includes blocking the track). The web site says that this road is "4WD only; 2WD as far as the car park". I have no idea where the "car park" is meant to be, perhaps it is at the top of the hill as you enter the park. Later, when I thought about this, it is possible that it is where we are camped and the actual camping area is located further along the track across the small creek to the north of us which is blocked by vegetation. Who knows? While this is a nice spot, it is not a camping area that should be listed as many people would be very disappointed with it. However, it is the sort of site that we like to camp at, with no other people around. The site is right on the Myall Creek, but it is a bit hard to get down to it as there is a lot of undergrowth, probably as so few people come here. It is really flowing, but I am not sure if it flows year round. There are also a few leaches around the camping area and we have fun throwing them in the fire. Once again, the rain eases as we arrive (2:30 pm) so we set up camp. The rain makes it impossible to do much but sit and read our books. We read for the next couple of hours till drinks o'clock. At 4 pm I start the fire which takes a while to get going. We have a lot of timber that we collected yesterday (we did not use any last night). I soon have a good fire going but later heavy rain almost puts it out. This is a problem as we need a lot of coals to cook our roast dinners. During a short break in the rain, Ron and I decide to have hot showers, so I set up the car's system and we have refreshing showers. It starts raining as I finish my shower and continues for the rest of the night. The heavy rain I mention has dampened the fire so we resort to Plan B. This is to use hot rocks (large heat beads) for the camp ovens. Unfortunately this takes about an hour to get them burning enough to use. Ron has perfected this method so we finally have enough of these, together with the coals we have managed to get from the now reinvigorated fire, to cook our roasts. Ron is cooking a chicken and we have a stuffed roast pork. Finally, our roasts are done. We share the meat, with each of use doing our own vegetables. Excellent meal as usual. After dinner, Kelly decides to cook a chocolate cake using the remains of the hot rocks. She has brought along a cake mix and makes it up. She puts it in the spring cake pan and about 30 minutes later it is ready. Her plan is that we will have some for dessert and the rest will be for morning tea. It is a little under cooked in the middle (needed more heat under the camp oven) but this is okay for a dessert. We read a bit more after dinner before retiring for the night. I sleep very well, as apparently it really poured again during the night.